Originally from country Victoria, where he has played the majority of his footy with the Minyip Murtoa Football Club in the Wimmera Football League, Delahunty has played five games and kicked five goals in his first NTFL season with the Saints. The 25-year-old will relocate to Darwin permanently in a few days, where he is set to join his new Thunder teammates in pre-season training. Predominantly used as a forward, Delahunty can also play in defence and has enjoyed previous stints as a backup ruckman. NT Thunder Head Coach Darren Reeves spoke to Delahunty’s versatility. “Kieran has played some excellent football for St Mary’s this season at both ends of the ground. “He reads the play well and is mobile around the ground. His inclusion in the team will give us some nice depth and options in key position areas, which was a focus for us when recruiting players for this year,” he said. NT Thunder Manager Andrew Hodges said Delahunty came into focus after strong performances in the NTFL. 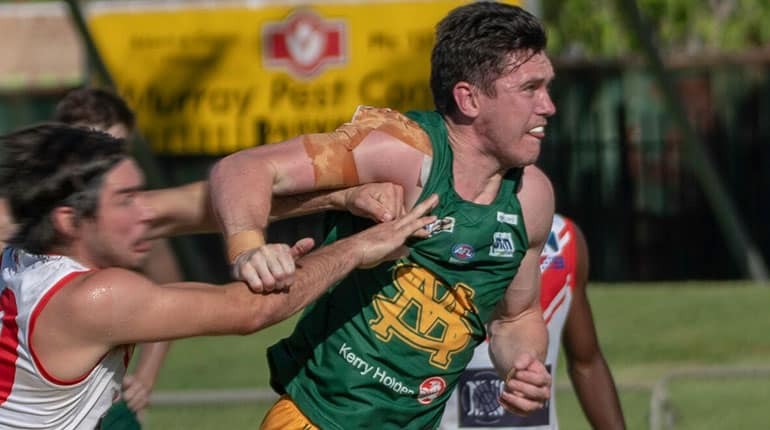 “When we first spoke to Kieran it was clear he loved the NT style of footy and was thoroughly enjoying his time with St Mary’s so the opportunity at Thunder came up at the right time. “There are plenty of guys like Kieran who come to the Territory to give it a go, and while doing so, they help lift the standard of our local comp but also set themselves a challenge. “They are recruited into specific roles that we don’t have Territory bred talent to fill, and while here they share their skills and develop our youngsters both on and off the field, which is invaluable,” he said. Delahunty said he welcomed the opportunity to play at NEAFL level. “I’ve enjoyed my time in the Territory with St Mary’s so far, so I’m really excited to move up and get involved in the community. “The challenge of switching roles and stepping up to a higher level of footy is something that I’m looking forward to,” he said.